Bulls hope to have a better outcome tonight in Game 2 against Brooklyn. Bulls hope to have a beter outcome tonight in Game 2 against Brooklyn. Panic for the Bulls? No, leave that reaction to the fans. Concern? Not quite yet. 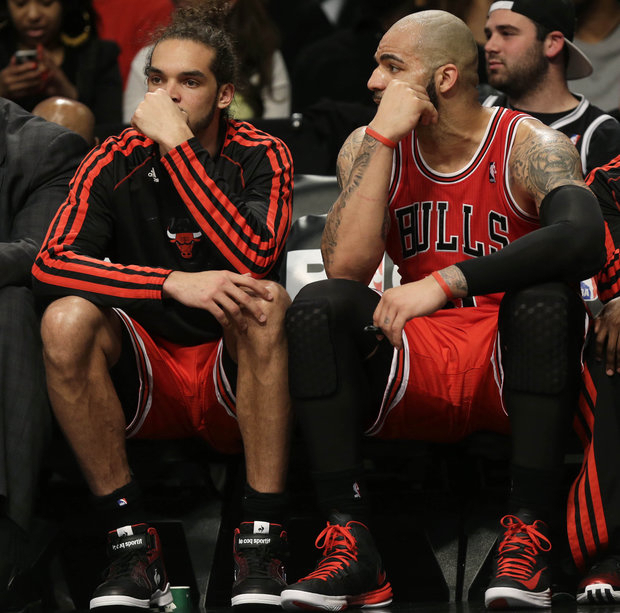 On Saturday, the Bulls had an embarrassing 106-89 loss to the Nets in Brooklyn. A win tonight is not a must, but to leave New York down 0-2 would be tough when they return to play in Chicago on Thursday. It was a surprise that Joakim Noah was able to start the playoff opener after he indicated Friday that he may sit out with his sore foot. Although Noah was limited and is dealing with pain, his effort was noble against the Nets All-Star center Brooks Lopez. After Sunday’s practice, coach Tom Thibodeau said Noah and a banged up Kirk Hinrich will both make the effort to be in the starting line-up. Hinrich suffered a thigh bruise from a screen set by Brooklyn’s Reggie Evans. What do the Bulls need to steal a win at the Barclays Center? Turn up their defense and try to get the Nets Deron Williams out of any shooting rhythm. The Bulls strongest attribute is their defense. \If they let down that part of their game they are sunk. You cannot allow a team to shoot 55 percent from the field in the playoffs. Williams is not the only Brooklyn weapon, but is their best. Lopez is a good scoring center, but he can also be scored on. The Bulls collectively have to make the Nets work on every offensive possession, no easy baskets, otherwise, their confidence will improve as the game and series continues. If there is one player the Bulls need to get back on his game, it is Luol Deng. His leadership as a defender and movement without the ball allows the Bulls to score. There is no telling if Deng is bothered by the several injuries he endured over the course of the season. His role is essential if the Bulls want to extend and possibly win the series. The only players who had decent offensive stats in Game 1 were Carlos Boozer with 25 points and 8 rebounds and Nate Robinson with 17 points off the bench. They need more production up and down the lineup. Points-in-the-paint is a matter that the Bulls will want to dominate and get to the free throw line. Thibodeau needs to “coach up” tonight. Playoffs are about a series of adjustments, and it is up to Thibodeau to make them. Maybe Noah should come off the bench. The Bulls are a battered and bruised team and they have to go in now as “Road Warriors”. They have to take the crowd out of the game, attack the Nets and grab the tempo. If the Bulls can make it more their plodding and physical style, it makes it a tougher game for a crowd to get into. It doesn’t feel right to see Derrick Rose on the bench. It must be a reminder to the team of what they are missing, especially since he has been working out and practicing. Right now mental focus is a factor and having Rose there may be a distraction.